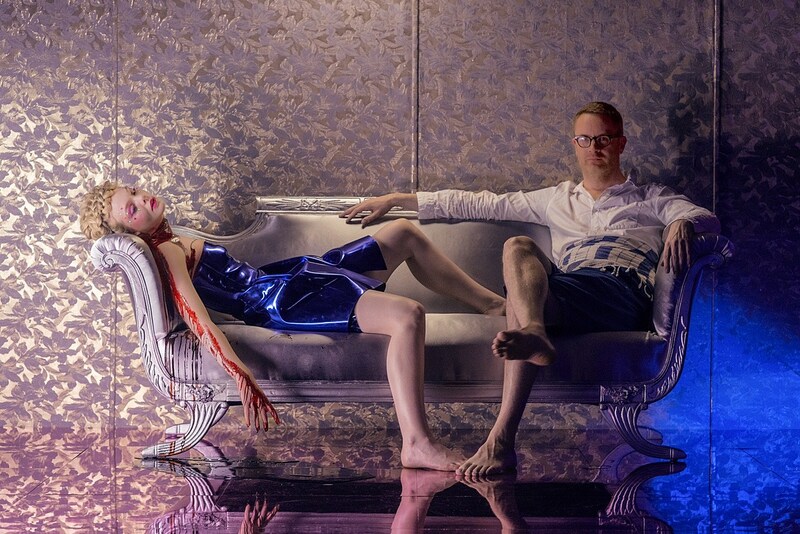 One of our most anticipated upcoming projects is Nicolas Winding Refn’s The Neon Demon, the director’s follow-up to Drive and Only God Forgives. In keeping with the aesthetic of those films, the first images from his new horror project feature a lovely Elle Fanning doused in neon lighting and dripping with blood. It’s almost too painful to know we probably won’t see this movie until 2016. Twitch debuted the first images from The Neon Demon — the first, above, is a little tame, with Fanning featured in luxe neon lighting, appropriate for the film’s title. The second, below, is a bit more curious, with Fanning draped over a couch, her throat slit and blood dripping to the floor, while Refn sits on the other side. That’s a great promotional image, and one I imagine we’ll be seeing more of in the months to come. Refn’s wife and producing partner Liv Corfixen previously revealed that the film is inspired by Countess Elizabeth Bathory, who — as legend has it — bathed in the blood of virgins to maintain her youthful appearance during her long reign of terror. The Neon Demon is currently filming on location in Los Angeles, and features an absolutely fantastic cast: Abbey Lee (Mad Max: Fury Road), Christina Hendricks, Bella Heathcoate, Jena Malone, Keanu Reeves (!!!) and Desmond Harrington.